Is your home due for a makeover? If so, visit us and explore the riveting world of laminate flooring. Laminate is the gorgeous luxury flooring alternative whose affordability makes it a perennial favorite among our customers. If you’re new to laminate flooring, you’re in for a surprise. The dizzying variety of laminate available gives you much to choose from. Whatever your interior design preferences are, we have a laminate that is just right for you. Laminate floors are the perfect way to tie together all of your home’s design elements. The various colors and patterns laminate offers provide an ideal complement to virtually any theme or motif inside your home. Get excited about your floors again with the laminate that makes your interior pop. Our comprehensive inventory has a style of laminate to suit any taste. No matter how contemporary or conservative (or somewhere in between) your tastes are, you’ll find something to love among our numerous laminate flooring options. Due to today’s advanced flooring technology, laminate can imitate any surface. Laminate is an innovative product composed of three layers, the top of which is a high-resolution photo that can be texture-treated to give the impression of authentic hardwood, ceramic, tile, and so much more. However, given its composition, laminate is softer and more forgiving to the feet than other flooring options. Standing for long periods on laminate is the comfortable experience that will upgrade any home. Just as importantly, laminate is available at only a fraction of the cost of the materials it imitates. Our laminate floors offer you the durability you need for your home’s high traffic areas. Laminate’s resilience to pressure guarantees that it’s the flooring solution that will last for years. Additionally, laminate is resistant to both moisture and dirt, making it an easy-to-clean, no-fuss luxury upgrade, perfect for the busy home with kids and pets. Today’s demands leave little time for household cleaning. Laminate is the smart choice for busy homeowners who don’t want to take precious time maintaining their flooring. A quick sweeping and mopping will keep laminate looking fresh and new for years to come. Our experienced laminate flooring installation team will guarantee that your new flooring is installed correctly for a great new look that will last. Flooring installation presents many unique challenges and many opportunities to make mistakes that could compromise the longevity and appearance of your flooring. Our professionals, though, have the skill and experience necessary for avoiding such pitfalls. You can be confident that your new flooring will be installed quickly and efficiently, so that in no time at all you’ll be enjoying the allure of your new laminate. With the professional support we provide, you can be sure that the hardest part of your flooring experience is choosing just which of so many beautiful laminate options is the one for you. Visit our store and see for yourself why laminate is the preferred flooring option for so many homeowners. 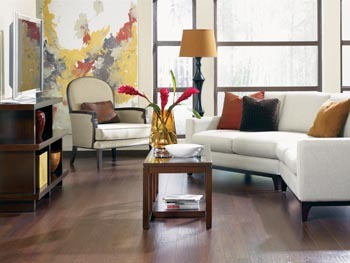 Affordable, reliable, and irresistible, laminate floors are sure to add elegance and charm to your living space. Contact us today to get started on your exciting laminate flooring project. We proudly serve our customers in Raleigh, North Carolina.